Tulsa, OK Violin Lessons Near Me | Fun Classes. Top Tutors. Check out some of our most popular teachers near Tulsa, OK including Broken Arrow, Bixby, Jenks, Mounds and Coweta. I'm passionate about music and have over 20 years experience teaching the violin. I accept students from beginner to advanced levels and will help you achieve your goals whether you are wanting to learn the violin as a hobby, for school or pursue music as a professional career! I love teaching, and enjoy passing on that joy, knowledge, and experience to my students! I tailor lessons according to the student's goals, abilities, and preference in musical styles. Whether you're wanting to learn the violin to be a virtuoso or just as a personal hobby, I believe you should enjoy the learning process! bles. I have a broad education in music with knowledge of classical, modern, and world music, as well as advanced training in music theory which I incorporate in private lessons. I have also studied conducting, music analysis, music history, voice, and advanced piano. While I specialize in classical music, I help my students discover what genre of music they're passionate about learning, including classical, jazz, pop, and fiddle. Lessons include scales, technique, ear training, sight reading, music theory, solos, duets, music performance and the option to prepare for auditions and orchestras. I tailor the curriculum I use depending on the need of each individual student. Please contact me for up to date lesson availabilities! She's very good. Very patient and clear. She'll tailor the lessons to your level of understanding. I'm an older adult learner with no musical knowledge at all and am learning fast thanks to her. I look forward to continuing my lessons. I’m not a young student, therefore It takes me longer to learn, Connie is a true professional. She uses methods that work for me and so far I’m enjoying it very much. I highly recommend her. Thanks Connie! Connie was great! Looking forward to continuing lessons. If you're a young beginning student, we'll spend a few weeks getting to know the violin using a whole-body (and fun) approach. We'll find to find a magic x, learn a very fun song about ants digging all the way to Greece, and making the statue of liberty. With a whole body approach to the violin, we start by setting up the technical side of things for ease and comfort of playing, while making a beautiful tone from the beginning! With every age group and experience level it is different. We'll start from the first lesson figuring out what your level is, and how we can immediately keep learning to exceed any expectations. If you want to pick up the violin after some years off, we'll start by seeing what you do remember - helping your body remember the ropes (don't worry, it's pretty quick work, and very rewarding), and then we'll set some new goals for you and our work together. I teach beginners as early as age 4.5 and have taught groups of adults as well. I am an advanced player, but typically teach beginners up to mid-intermediate level. I've been playing violin since elementary school. I went to Eastern Michigan & played in the orchestra and I've attended summer music camps galore including Blue Lake Fine Arts Camp and Interlochen. I traveled throughout Europe with Blue Lake & also played with their Alumni Orchestra. I've been teaching since 1990 and currently teach both in several studios as well as online. As a teacher, I like to get to know your interests and goals for playing the violin so that we can structure lesson plans that will help you keep your interest and continually help you improve. Violin does take practice so it's important to play often at home in advance of lessons and you'll hear success! I use both Suzuki & Traditional methods in my teaching style. First time handling a violin but I already feel good about it. A great teacher. Kecia is a very patient, kind and knowledgeable instructor. My 10 year old daughter was very comfortable with her and had a lot of fun at her lesson. I've taught violin for over ten years. I promise you'll have an exciting first lesson! I've been a violinist for Glee (1000 Miles), Kevin Olusola (Pentatonix, "Heart Attack"), and Perla Batalla (Leonard Cohen). I have a BFA degree in Violin Performance/Composition from the California Institute of the Arts. 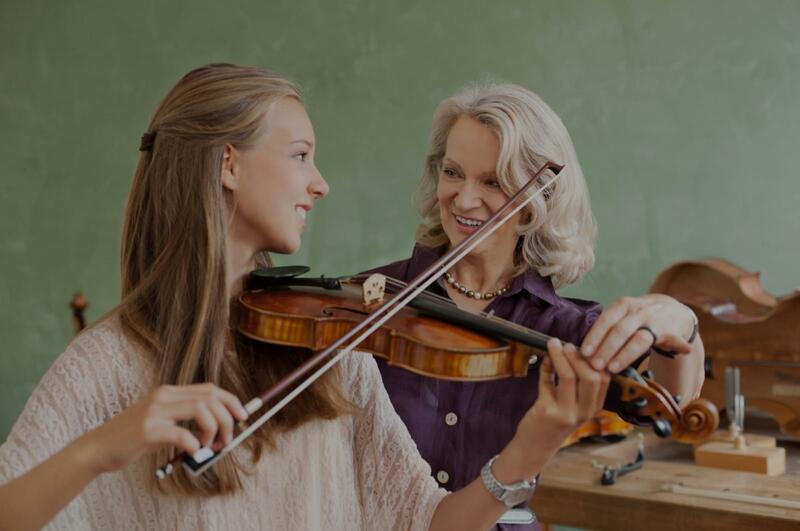 Our lessons will focus on strengthening technique and sight-reading skills first and foremost, and we'll get you started to being the violinist you've always wanted to look and sound like. I am Andy. I am a graduate of the California Institute of the Arts with a BFA degree in Composition/Violin Performance. I will be attending school again in the Fall to get my teaching certificate to teach in the public school system. My violin playing has been featured on Glee, with Kevin Olusola (Pentatonix), and guitar featured on shows like Rachel Ray and Dr. Phil. My main passions are songwriting, and collaborating with other great musicians all over the country. eave a lot of flexibility to cater lessons around your interests. If you ask to play a certain song, I will find a way to help you play it. Every goal is achievable with practice, dedication, and fun! I have been playing violin since the age of 6. One day I had to make the difficult decision choosing between violin and piano, because both instruments are very dear to me. I chose violin as my primary instrument for its lyrical qualities and closeness to human voice. At the age of 13 I won the Saint Petersburg Violin Competition and performed with the Saint Petersburg Philharmonic. I am excited to share my love for this instrument with my students no matter what age they are. I see each person as an individual who has their own artistic voice and I will help you to further develop it. Hello dear students! My name is Artem and I'm 25 years old. I have been playing violin since I was 4 years old and am a freelance musician, composer and pedagogue. I am passionate about teaching because I believe education and willingness to learn is an extremely important factor for personal development and success. d discover new ways to teach Russian and English to others. I am excited to get to know you and share my knowledge with you! Not only is Artem a world class violinist but also a very nice person who will make you look forward to the next lesson. Artem is extremely professional, positive and great MAESTRO!! In the short time I have been with Artem he has taught me valuable foundation techniques. I highly recommend Artem for students who are serious about fine musician techniques and being world class artists! Artem is an excellent teacher. He provides the perfect balance of explanations, demonstrations and expectations for at-home practice. Thank you so much! Featured in concert by WILLIE NELSON and with over 30 years of live performance and teaching experience, Jennifer's plethora of musical knowledge in various genres makes her a high in-demand instructor ranging from beginner to advanced. A background in Suzuki ear training and classical studies combined with fiddle, jazz and improvisational skills enables Jennifer to custom tailor music instruction towards each individual student's goals and needs. n pupils, Jennifer's ability to accompany violin students on piano during their lessons makes the learning experience that much more valuable. Miss Jennifer is the best! She has been so kind and such an amazing teacher. This is my first time ever learning how to play piano and she is so patient with me! I am so excited to continue and learn so much more from her! In her teaching, Mimi specializes in helping her students achieve all their goals. She encourages and nurtures her students, builds up their confidence levels and character, and improves their techniques and skills in each lesson. Students can hear the improvement in their playing in each lessons. Mimi has developed a very experienced, masterful and supportive teaching style, she used extremely helpful techniques for studying and practicing music. Mimi shares her musical gifts and love of music with all her students. Mimi is a world class musician. She has been teaching Viola, Violin, Composition and Improvisation techniques for over 25 years. Mimi studied personally for several years with Itzhak Perlman, the great, legendary, violin concert soloist. Mimi toured with Barbra Streisand and also recorded movie scores in Los Angeles. In New York City she has played in The Metropolitan Opera Orchestra, The New York Philharmonic, and debuted as a soloist at Carnegie Hall. Mimi also played in The San Francisco Ballet Orchestra as principal violist, The San Francisco Opera Orchestra and The San Francisco Symphony. Mimi has also recorded and released 5 CD's featuring her as a soloist. As a violist with a Master’s degree in Performance from the prestigious Colburn Conservatory, an experienced teacher mentored by respected Suzuki expert Shelley Bears Schleigh and chosen for a Teaching Fellowship with renowned Robert Duke, and an individual with an insatiable passion for psychology and development at all stages, Rachyl offers the complete package of polished performer, trained teacher, and passionate mentor. She has a particular interest in the development of young children, and, having moved to New York in 2017 from the San Diego Symphony to teach at the Brooklyn Music School, Rachyl is living her dream as a teacher. Her main goal for 2018-19 is to further this dream by expanding her studio. You/your child will receive consistent, dedicated care, individually tailored attention according to needs, abilities, and learning styles, and the inspiration to feed the brain and the soul with musical knowledge. Teaching is my passion, and the reason I moved to New York. From a young age I have always been deeply invested in the subjects of Development and Nurturing. I consider it my calling in life to pursue these subjects through teaching. My goal is always first and foremost to form a true connection with each individual student, observing their learning patterns carefully and trying different approaches until the student is thriving. My approach is continually positive, reinforcing excellent habits and achievements, and striving to find tiny goals that make a student feel he or she is constantly succeeding. My students find that their trajectory is continually upwards. You or your child would receive regular performance opportunities, regular specific feedback, consistent attention and high-quality musical training. , and a violin and viola instructor from the Philadelphia area. I graduated with my Master of Music in Performance with a Teaching Fellowship from the Colburn Conservatory in Los Angeles, a selective school which accepts only 125 students total on full scholarship including room and board. I also spent one year in the San Diego Symphony. I have performed in eight states as well as in Canada and Austria. I now teach lessons at the Brooklyn Music School and for such agencies as Thumbtack, Musika, and Music To Your Home. Last year I taught music at the Brooklyn Heights Montessori School. My primary background is in the Suzuki Method; I have taken the official introductory course this past year, and plan to become officially certified this year. I have taught all levels, learning styles, and ages, I have background working with students who need special consideration, such as those on the autism spectrum or with attention disorders. Rachyl does a great job with very young children. We've loved having her teach our kids violin for the last year or so. Rachyl is a fantastic teacher - patient, accessible, kind, and fun. I'm a violinist of 17 years and I'm a graduate of the Crane School of Music with a Bachelor of Music in Violin Performance. At Crane I studied the principles of Suzuki Teaching and took the "Every Child Can" course. I believe in providing a nurturing, welcoming, and warm atmosphere in which to foster students on their musical journey! I started violin at the age of seven after being inspired by concerts my parents took me to when I was younger. Jesse Parker is a professional violinist of 17 years and originally from Kingston, NY. Parker has performed in many venues/weddings all across New York, Ohio, Michigan, New York City, the Hudson Valley, the Adirondack Region, Westchester and parts of Connecticut. Parker is a graduate of the Crane School of Music with a Bachelor of Music in Violin Performance and is currently living in Binghamton NY. Parker can offer a beautiful addition to your wedding or any other occasion with classical/pop violin music! Parker has performed in various venues including Carnegie Hall, Steinway Hall, the Eastman Kodak Theater, Hosmer Hall, Olin Hall, Snell Theater and at the Avery Fischer Center for the Performing Arts. the Orchestra of Northern New York. Parker started violin at the age of seven after being inspired by concerts her parents had taken her to when she was younger. Professional Yet Fun. I have 20 years teaching experience teaching private lessons. I hold a bachelor's degree from BYUI in Music Ed and have taught for 3 years in the public schools. I took some time off to have children, (three boys! ), and follow my husband's career in Software and our side business in Rental properties and Real Estate investments. I'm ready to get back into teaching again and am looking for a few music students as teaching is my real passion. With 20 years experience teaching privately I am professional yet fun. I have a bachelors degree in Music ED from BYUI and taught for three years in the public schools. I took some years off to have children (three boys!) and accompany my husband in his career in software and our Real Estate side business. Now I’m ready to get back into what I’m really passionate about which is teaching! Can't find a teacher in Tulsa, OK? for you. I've progressed rapidly in eight months of weekly instruction from a complete beginner playing his first notes through Suzuki Book II. Mimi is FUN to work with -- patient, encouraging and inspiring. She truly loves to teach and it shows." Tulsa, OK teacher: Mimi D.
"Excellent instruction, patient and kind"
"Mimi is an excellent and patient teacher and very sweet person. I recommend all to have her as a tutor." "My daughter enjoyed her lesson very much! She felt so much more comfortable with her music after the lesson." and encouraging. I look forward to my next lesson. I was a little intimidated by her vast experience , she reassured me and put my fears at ease. She also has experience teaching adults which is what I was looking for . I am 50 years old and have no experience playing violin ." "Mimi continues to be very patient and kind. I feel I am progressing in my learning/skills nicely. I could not ask for a better instructor!" "I love my lessons with Mimi, she is so patient and so very helpful to me !! I love this!!" "I am learning so much! I enjoy my weekly lessons and I am always looking forward to the next one. She is an encouraging and patient teacher."